DESCRIPTION A substantial and individual Detached Family Home, situated in this non-estate position within the popular Town of North Hykeham. The property is situated on a generous plot, with a driveway providing ample off-street parking and a good-sized lawned garden to the rear, with various seating areas. The property has sizeable and flexible living accommodation briefly comprising of; Entrance Hallway, Cloakroom, Shower Room, Study, Lounge, Sitting Room, 40ft Open-Plan Living Kitchen, Utility Room, Master Bedroom with En-Suite Bathroom, Three Further Bedrooms downstairs and a spiral staircase leading to First Floor Landing with Two Further Bedrooms, En-Suite Bathroom and En-Suite Shower Room. The property further benefits from a Detached Self-Contained Annex comprising of; Kitchen with stairs leading to First Floor Landing with Living Area, Bedroom and Shower Room. There is also a Store Room with Utility Area. Viewing of the property is recommended. The property is well located within the popular residential area of North Hykeham which is located South West of Lincoln. The property is close to a wide variety of amenities including schooling of all grades, Doctors’ Surgery, the Forum Shopping Centre, ASDA superstore, public houses and train station. There is easy access to the A46 bypass which in turn gives access to the A1 and the Mainline Train Station at Newark. 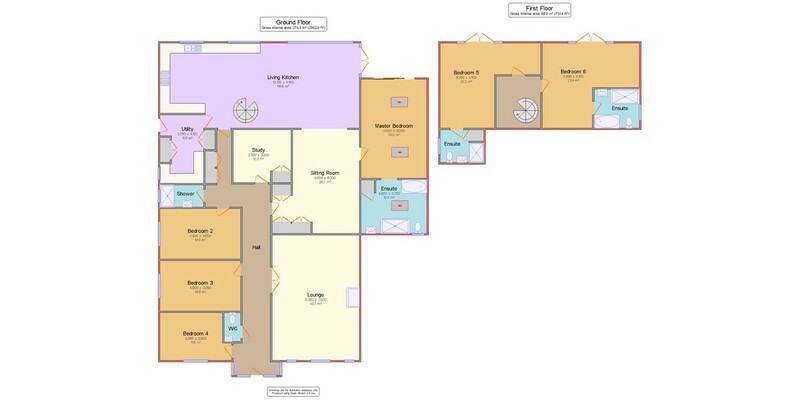 ENTRANCE HALL With external door and windows to front elevation, tiled flooring, three radiators, storage cupboards, spotlighting, coving to ceiling and doors leading to Cloakroom, Lounge, Three Bedrooms, Shower Room, Study, Open-Plan Living Kitchen and Sitting Room. CLOAKROOM With tiled flooring, partly tiled walls, suite to comprise of; low-level WC and wash hand basin. Heated towel rail, coving to ceiling and extractor fan. SHOWER ROOM With uPVC double glazed window to side elevation, tiled flooring and partly-tiled walls, wash hand basin and mains shower with tiled flooring and drain, heated towel rail and coving to ceiling. STUDY 11′ 4" x 10′ 5" (3.45m x 3.18m) With laminate flooring, radiator, coving to ceiling and storage cupboard. LOUNGE 24′ 9" x 17′ 3" (7.54m x 5.26m) With three uPVC double glazed windows to front elevation, large feature fireplace with log-burner inset, two radiators, coving to ceiling and wall lighting. 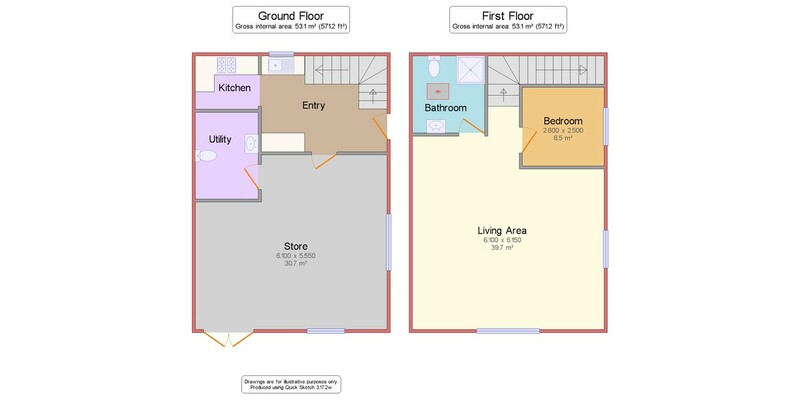 SITTING ROOM 20′ 7" x 17′ 3" (6.27m x 5.26m) With laminate flooring, two storage cupboards, two radiators, coving to ceiling, opening to Open-Plan Living Kitchen and door to Master Bedroom. OPEN PLAN LIVING KITCHEN 40′ 4" x 16′ 7" (12.29m x 5.05m) With three uPVC double glazed windows to rear elevation and uPVC double glazed double doors to side elevation, tiled flooring and fitted with a range of wall, drawer and base units, with work surfaces over and tiled splashbacks. Two bowl composite sink drainer with mixer tap, breakfast bar, space for Range Cooker with extractor fan over, space for fridge freezer, plumbing and space for dishwasher, three radiators, spiral staircase to first floor, spotlighting, coving to ceiling and doors leading to Hallway and Utility Room. UTILITY ROOM With uPVC double glazed window and external door to side elevation, tiled flooring, fitted with a range of wall, drawer and base units with work surfaces over and tiled splashbacks. Stainless steel sink and drainer with mixer tap, space for freezer, airing cupboard housing hot water cylinder, wall mounted gas fired central heating boiler, storage cupboard, radiator and coving to ceiling. MASTER BEDROOM 19′ 9" x 13′ 0" (6.02m x 3.96m) With uPVC double glazed double doors to rear elevation, tiled flooring, built-in wardrobes and drawers, two Velux windows and door leading to En-Suite Bathroom. EN SUITE BATHROOM 13′ 0" x 10′ 7" (3.96m x 3.23m) With uPVC double glazed window to front elevation, Velux window, tiled flooring, partly-tiled walls, suite to comprise of; low-level WC, wash hand basin with drawers below, walk-in shower cubicle, Jacuzzi bath, heated towel rail and airing cupboard. BEDROOM 2 16′ 0" x 10′ 0" (4.88m x 3.05m) With uPVC window to side elevation, radiator and coving to ceiling. BEDROOM 3 16′ 0" x 9′ 9" (4.88m x 2.97m) With uPVC double glazed window to side elevation, radiator and coving to ceiling. BEDROOM 4 12′ 4" x 9′ 3" (3.76m x 2.82m) With uPVC double glazed window to front elevation, radiator and coving to ceiling. FIRST FLOOR LANDING With access to roof void, coving to ceiling and doors leading to Two Bedrooms. BEDROOM 5 18′ 7" x 17′ 1" (5.66m x 5.21m) With uPVC double glazed double doors and windows with Juliette Balcony to rear elevation, access to roof void, coving to ceiling, radiator, heated towel rail and door to En-Suite Shower Room. EN SUITE BATHROOM With uPVC double glazed window to side elevation and suite to comprise of; low-level WC, wash hand basin, walk-in shower cubicle and bath, heated towel rail, spotlighting and extractor fan. BEDROOM 6 19′ 10" x 16′ 2" (6.05m x 4.93m) With uPVC double glazed windows and double doors to rear elevation, radiator and coving to ceiling. EN SUITE SHOWER ROOM With uPVC double glazed window to side elevation, suite to comprise of; low-level WC, wash hand basin, shower cubicle and storage cupboard. KITCHEN 13′ 0" x 9′ 7" (3.96m x 2.92m) (narrowing to 6′ 3" x 5′ 4" With uPVC double glazed external door and window, tiled flooring, stairs to first floor and fitted with a range of wall, drawer and base units with work surfaces over and tiled splashbacks. Stainless steel sink drainer with mixer tap, integral oven, four ring gas hob with extractor fan over, space for fridge freezer, plumbing and space for washing machine, radiator, spotlighting and door to storage room. FIRST FLOOR LANDING With door to Living Area. LIVING AREA 20′ 3" x 20′ 1" (6.17m x 6.12m) With two uPVC double glazed windows, access to roof void, spotlighting, two radiators and doors leading to Bedroom and Shower Room. BEDROOM 11′ 3" x 8′ 6" (3.43m x 2.59m) With uPVC double glazed window and radiator. SHOWER ROOM With Velux window, suite to comprise of; low-level WC, wash hand basin, walk-in shower cubicle, partly-tiled walls and heated towel rail. STORE ROOM 20′ 1" x 18′ 2" (6.12m x 5.54m) With two uPVC double glazed windows and uPVC double glazed double doors, radiator, power, lighting and door to Utility Area. UTILITY AREA With low-level WC, wash hand basin, work surface and plumbing and space for two washing machines and wall mounted gas fired central heating boiler. OUTSIDE The property is approached by a large driveway, with a gravelled area to the side providing ample off-street parking, which gives access to the rear of the property and the Store Room with Annex. To the rear of the property, there are generous lawned gardens with two decking seating areas, two patio seating areas, block-paved seating area, textured slated area and flowerbeds with a range of plants, shrubs and trees.